Ship building quickly became a major activity on Humboldt Bay - responding to the commercial boom and the availability of lumber. Over the years, a number of shipyards prospered, attracting workers from all over, particularly Scandinavia. With the shift from sailing ships to steam powered vessels, local ship building declined. It revived during both world wars and continues on a small scale today. Fishing was important for the area's native population. Most activity focused on the rivers, but coastal tribes collected shellfish and did some surf fishing. Ancient sites of coastal Indian settlements can still be identified by the mounds of discarded seashells. The settlers soon began commercial fishing. Humboldt Bay provided crabs and oysters. Other species, particularly salmon, were pursued on the open sea. Live crabs were shipped in barrels to San Francisco. 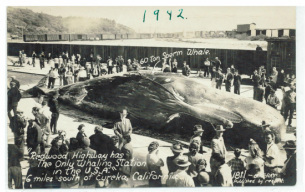 Fish could be transported more quickly after the arrival of the railroad in 1914. The commercial fleet grew to about 500 boats in the 1960s. At times, whalers operated out of Humboldt and Trinidad bays. The last whaling station in the county closed at Fields Landing in the 1950s. Humboldt Bay was active with ship building, commerce and fishing. Tug boats piloted ships into the difficult harbor. Until the Samoa Bridge was completed in 1971, ferries carried mill, dock and shipyard workers to sites around the Bay. One of these launches, the Madaket, has been in continuous service since 1910 and now offers harbor cruises. Humboldt's coast with its fog, rocks, sand spits and treacherous currents, posed hazards to shipping. Despite lighthouses along the coast, many vessels were lost. The most spectacular wrecks occurred off Samoa in the winter of 1916/17. An American submarine beached itself in the fog. Attempting a rescue, the cruiser USS Milwaukee was also beached. The crew was saved, but the ship's components and contents were salvaged by the navy and local souvenir seekers. Today the Milwaukee's iron skeleton can still be seen at minus tides.